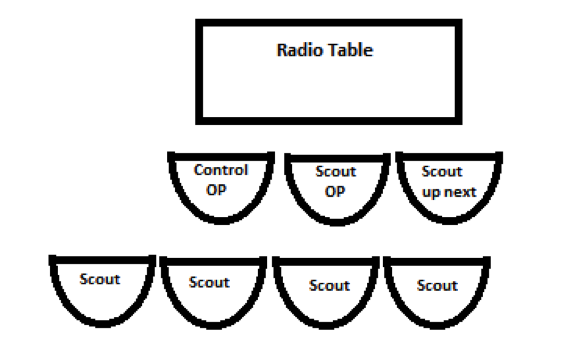 Russ Mickiewicz, N7QR, member of the BSA National Radio Scouting Committee and long time K2BSA Jamboree staff member, has developed some helpful guidelines for your Radio Scouting station operations. These have been developed over several years running the Jamboree demonstration station and well as events in his local council. We hope they'll offer insight for your station operation. You can download a PDF document Station Operation or read the same information below. A radio capable of voice or data with the possibility of solid copy (although others will do.) If at a camp, a rain shelter is advisable, either a camp shelter or a pop up. Enough battery or power within an extension cord length should be available. A couple of times I put in a cube tap in line with the coke machine. An area where a patrol or den-worth of scouts can be engaged at a time, including chairs for all. There should be 2 or 3 chairs directly in front of the radio set up with the rest directly in back of these so all can see and hopefully hear. If you must use earphones, have at least three sets. The three earphones and chairs are assigned one to the control operator, one to the scout you are working with and one to the scout who is up next. I find one mobile mic that is passed around works best. Scratch paper and pens to draw explanations of what is going on, additional optional items: a map of the US or the world with radio zones, a frequency chart, a diagram of how skip works, a diagram of how repeaters work. Paper log or logging program with space for noting which scouts get on the air. Also a list of third-party agreement countries is necessary to make sure you don’t violate any FCC rules. Enough other support people such as Arrow men, other hams, or parents, for crowd control and queuing patrols or dens without interrupting the control operator. Something that the scout can leave with that will commemorate the visit – a patch, A QSL or eyeball QSL card, a small certificate that may fit in their pocket with one fold. If the event is with a simultaneous Webelos Woods there may be takeaways provided, for camporees, there may be scorecards to mark or punch. Optionally you can apply for the K2BSA/n call and if you apply early, have a chance of using it for the weekend, or perhaps your council has a vanity call that you can sign out. Before the first scout shows up, it would be good to have a station standing by or have a sched. Preferably this is with a station that can be copied Q5 easily for the untrained ear, who’s English is easily understandable (extra credit if you have scout fluent in a foreign language and you can use that. Spanish many times works out perfectly, especially to South America, and I have one time have had a scout use Japanese on digital.) Also, it helps if the other station has a scouting background, or better yet, is another JOTA station or is at a scout camp, so you can have a scout to scout QSO. Explain to the scouts what is going to happen – use the EDGE method. Demonstrate by exchanging pleasantries with the other station yourself. Guide the first scout in using the mic or the keyboard. Make sure they know they have to push to talk, usually end a transmission with “over” and they have to release the mic to be able to listen. Encourage them to give their first name and to use the other station’s operator’s name. This could be as simple as “Hello Alice, my name is Bob.” For those scouts that pick it up right away, try having them ID using the station’s call. Enable them to go it alone but have in your mind the standard question fare that you can use to prompt the scout: have them ask what is the weather there, how old the other operator is, where they ever a scout, do they work and what do they do. Often the first couple of times if copy is not good, you may have to repeat to the scout what the other station said or asked. While you are doing the control operators duties, you also have to keep the rest of the patrol engaged with emphasis on the scout who is up next. The better this next scout is engaged, the smoother the operation will go when he is at the mic. It is important to keep your eye ahead of the game by making sure the next scout is picking up what he will have to do. At the same time you are doing the above (and also having one ear tuned to the control operator’s duty) you should be filling out the log, noting who has been on the air (probably just the unit number, the patrol or den and the first name) and filling the takeaway certificate if any. Encourage all scouts to rotate into the up next position and then to the operating position but do not force any scout to talk on the air. If this is one of the items that count for points at a camporee and you have the ability to influence it, you could assign more points for talking on the air. At the end of their turn they should thank the operator for the chat and introduce the next scout who will talk. At the end of the patrols time, make sure they take all their certificates and takeaways (and their backpacks.) Tell your support people to usher them out and to usher the next patrol or den in. Make sure to ID every 10 minutes and always thank the other station for engaging the scout.